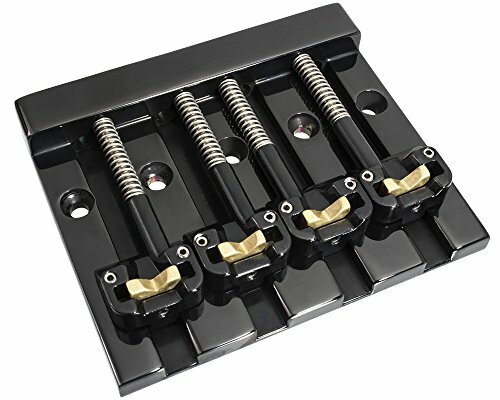 Lovingly dedicated to the granddaddy of high mass bridges, Hipshot® is proud to offer the KickAssTM Bass Bridge. They spent years plus countless versions ensuring that this 'tribute' would possess the soul of the original without being a copy. The KickAssTM features the following: Unique saddle design features pre notched inserts (no filing required). These inserts allow you to easily adjust your string spacing from a narrow .687" (17.5mm) to a wide .800" (20mm) and anywhere in between! Comes standard with brass saddle inserts which emphasize the fundamental tone and give your bass a mellow sound. Also included are two extra inserts for greater range of height adjustment. The KickAssTM mounts on a typical 5 hole bass configuration and features recessed string ball holes for a sleeker look. All mounting hardware included. If you have any questions about this product by Hipshot, contact us by completing and submitting the form below. If you are looking for a specif part number, please include it with your message.